In a vision to strengthen medicare for women and children and strive to become a medical center hospital to serve more patients at Hsinchu area, the Hinchu Branch of Mackay Memorial Hospital was officially name-changed as Hsinchu Mackay Memorial Hospital(HMMH) from 1 January 2017. The Hsinchu Branch of MacKay Memorial Hospital was initially established as an area hospital in 2002, yet in order to meet the multi-functional demands from the government, church, and hospital’s board directors, a transformation of her constitution into a financial legal person was accomplished in April 2016, according to Mr Liu Bor-en, chairman of the managing board of MacKay Memorial Hospital. A thanksgiving service for celebrating HMMH’s name-change and the inauguration of the new superintendent – Dr Su Chong-sien – was held in the international conference hall at the 13th floor of HMMH on 1 January 2017. Mr Lin Tzou-yien, Minister of Health and Welfare under Taiwan’s central government, was invited to attend the hospital’s new opening and the inauguration of Dr Su Chong-sien, who is a renown clinical physician specialized in the field obstetrics and gynecology and an experienced administrator in hospital management over 40 years. Rev Sudu Tada, Moderator of PCT General Assembly was also invited to witness the inauguration of Dr Su Chong-sien as the new superintendent. 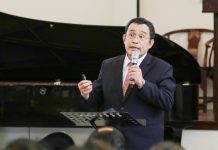 In his sermon, Rev Rue Chong-cheng, Moderator of PCT Northern Assembly, encouraged Dr Su to become a servant after God’s own heart, like the King David, serving the doctors, nurses, administrative staff, the patients and their families, and all the people whoever coming into this hospital. In his inauguration speech, the new superintendent Dr Su anticipated HMMH to become a hospital actively fulfilling her social responsibility and willing to become a good neighbor to the marginalized and the poor. 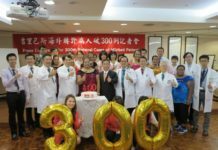 In order to practice the charity of the Christian faith, Dr Su also encouraged his colleagues to be compassionate to the patients and seeing themselves as own families. As to the future of HMMH, Dr Su shared his visions, including the methods of improving intensive medicare for the mother and their children, strengthening of the precision medicine and establishing a chronic care network, marching forward to a regional medical center. Witnessed under Mr Lin Tzou-yien(Minister of Health and Welfare, second from right) and Dr Seh So-chuan (the superintendent of MacKay Memorial Hosital, third from right), Dr Su Chong-sien (the first from right) took the seal from former superintendent, Dr Lee Hung-chong (the fourth from right) to become the first superintendent of HMMH on 1 January 2017.